There are many natural attractions on Black Bear Island Lake. 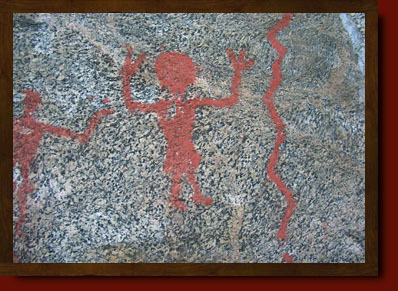 Rock paintings thousands of years old made by native tribes accept tobacco and gifts in exchange for prayers answered, and hidden monuments tucked on a distant shoreline pay respects to local veterans who gave their lives for us. Rapids, white-water and water falls contribute to the breathtaking northern beauty and amazing fishing while quiet bays give shelter from weather, many of which a hook has never been dipped before, and the tail splash of a beaver leaving his house tells others of your presence as they curiously swim past. The Boreal mosses and vegetation and bedrock and trees blend harmoniously into the blue skies and navy waters of the ever-flowing Churchill River. Resident eagles and loons and pelicans watch unconcerned, and bears, moose, caribou and wolves visit shore lines, watching as our boats slide past. The sun warms your face and the rocking of the boat hypnotizes your soul as you realize you have perhaps not even seen another boat all week.... It's just you... it's just you and paradise, and you are enveloped in the serenity; the peace is overwhelming! The unrivalled wilderness and solitude seem lifetimes away from the meetings and phones, the faxes and appointments, deadlines and commitments... and we haven't even gotten to the fishing yet! The fishing... can you just imagine? You are in one of the last elements of nature that is uncontaminated. The only way to get here is by float plane, this option is unopened for most, but you are here. You feel the excitement of a walleye hole, your heart pounds deep in your chest as a massive northern pike, decades old, latches your hook and uses their inborn wisdom, trying to out wit you and your abilities as a fisherman. The mornings bright with sunshine and hope cloak your expectations of what the day may bring, and when the purr of the boats arrive back at the dock you are weary, exhilarated, teeming with stories and chronicles of the days accounts etched deeply into everlasting memories. And to follow, how about a quiet deck to relax on and refreshments with good friends; dinner sizzling on the barbeque; the fragrance of uncivilized forests and sparkling fresh moving waters; a crackling campfire begging for stories; perhaps if you look into the star bright night skies the northern lights will perform for you in dances of color and motion most can only imagine; and then at the day's end, a warm, comfortable bed to console muscles that played hard, and the dreams of another day just like the perfection of this day to come tomorrow. 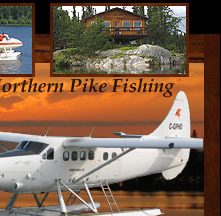 There are many fishing camps in northern Canada, but there is only one Pine Island. You really need to do this, you deserve it!